Toastmasters International is a nonprofit educational organization that teaches public speaking and leadership skills through a worldwide network of clubs. The organization’s membership exceeds 352,000 in more than 16,400 clubs in 141 countries. Since 1924, Toastmasters International has helped people of all backgrounds build confidence as speakers and leaders. 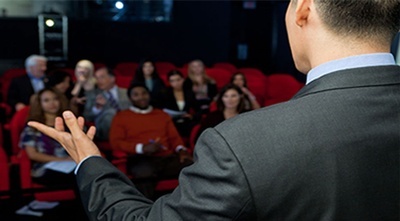 Better Speakers and Leaders Toastmasters is the best way for anyone—whether a working professional, student, stay-at-home parent or retiree—to improve his or her communication and leadership skills. Members overcome the fear of public speaking and learn skills that aid them in becoming more successful. Toastmasters creates better listeners and stronger team members and leaders who can comfortably give and receive constructive evaluations. Joining a Toastmasters club is easy. A listing of clubs by geographic area can be located on the Toastmasters website at www.toastmasters.org/find. Visitors to the website can select the most convenient club, attend a meeting and apply for membership. (Applicants must be 18 or older.) New clubs can be started with permission and assistance from Toastmasters International. Linda Lingle Former Governor of Hawaii “Toastmasters is the best and least expensive personal improvement class you can go to. Anybody who begins and sticks with it for any length of time ends up a better speaker. As a result, they build confidence and are able to do their jobs better. Listen, Learn & Lead meets on the 2nd & 4th Thursdays of every month from 4pm - 5pm at the Elgin Area Chamber of Commerce.